Jimmy Stewart's acerbic prep school housemaster Rupert Cadell confronts conspirators Brandon Shaw (John Dall) and Phillip Morgan (the late Farley Granger) during their decidedly macabre dinner party in Rope, Alfred Hitchcock's first foray into colour and the first of his two Transatlantic films, a venture set up to escape the control-freakery of superproducer David O. Selznick. Rope opens with an apparently quiet New York street scene before Joseph Valentine's camera peers in through the closed curtains of a Manhattan penthouse as a scream rings out from within. Inside we spy gay lovers Brandon and Phillip, two aesthete Raskolnikovs, stringing up a mutual acquaintance by the throat for sport. They hide his body in a chest in the centre of their living room and begin preparations for a party to which they have invited a gaggle of the deceased's friends and relatives. Brandon is by far the more impish and relaxed of the pair while Phillip, a fraught, uptight concert pianist, is constantly threatening to give the game away by drinking too much to calm his nerves. The guests begin to arrive and the festivities get under way. All goes swimmingly until the arrival of Caddell, the boys' former schoolmaster, who soon smells a rat and begins to ask difficult questions of his former charges. The film's story was taken from a 1929 play by English novelist Patrick Hamilton (author of the superb Hangover Square, 1941), which was adapted for the screen by actor Hume Cronyn with a script by an uncredited Ben Hecht and Arthur Laurents, a writer who would go on to such Hollywood heights as West Side Story (1957) and enter a long-term relationship with Rope's bisexual star Granger (a matter of some fascination for Hitchcock). Hamilton's drama was itself based on the sensational real-life case of Nathan Leopold and Richard Loeb, two homosexual University of Chicago students who captured and killed 14-year old schoolboy Richard "Bobby" Franks in 1924 as part of an intellectual game, to prove that they were among Friedrich's Nietzche's chosen supermen, the "superior few" privileged to commit murder. The "Trial of the Century" followed, in which famed capital punishment opponent Clarence Darrow successfully defended the undergraduates from death row by criticising their influences in higher education: "Is any blame attached because somebody took Nietzsche's philosophy seriously and fashioned his life upon it?... It is hardly fair to hang a 19-year-old boy for the philosophy that was taught him at the university." This theme was topical again in post-war 1948 after a certain Adolf Hitler had also misinterpreted Nietzche's thoughts on man's potential to atrocious effect. While Rope is a serious and pointed meditation on human nature and the delusions of those in positions of power, Hitch saw a perfect vehicle for his peculiar brand of black comedy and the chance for a major experiment with cinematic form. The Master of Suspense always enjoyed playing with audience expectations and toying with the boundaries of his craft, setting himself such challenges as using the smallest set possible (Lifeboat, 1944) to having his protagonist fixed in a stationary position with only one viewpoint (Rear Window, 1954) to killing off his nominal star midway through (Psycho, 1960). Here, Hitch tried to shoot the entire movie in one long real-time take and, although he didn't quite succeed in spite of extensive pre-planning and rehearsals (the camera occasionally has to drop into the small of Dall's back or the lid of the chest to sneakily conceal a cut), it's a fascinating endeavour. Aleksandr Sokurov achieved something similar with Russian Ark in 2002 but Hitch got there first over half a century earlier, albeit not without cheating. 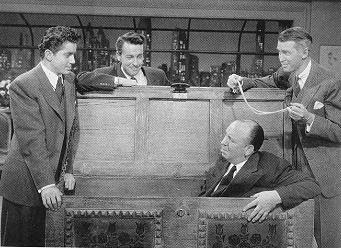 The premise and execution of Rope provided Hitch with endless opportunities for subversion. 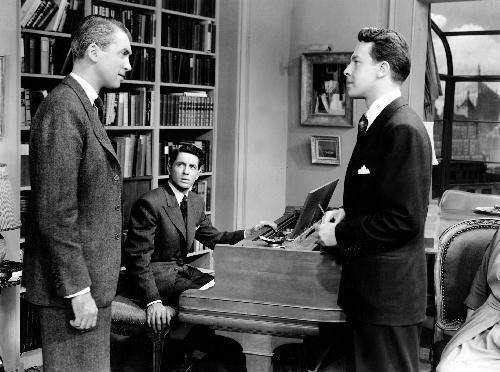 The film is full of in-jokes, from breaking the fourth wall in post-modern fashion by having his female characters gossip about a recent film they've seen starring Ingrid Bergman and Cary Grant (the latter having turned down the Stewart part in Rope, which was written so that Cadell's own homosexuality was hinted at more explicitly, for fear of what it might do to his image) to making endless puns about the stranglers' method of murder ("These hands will bring you fame", guest Mrs Atwater tells a suddenly very pale Phillip as he sits at the piano). The classically farcical body-in-the-trunk motif, which recurs in The Trouble With Harry (1955), constantly undermines everything the characters do or say - whenever it appears in shot we are reminded that this is no ordinary high society mixer we're witnessing. The ghoulish tone throughout has the big man's signature all over it, typified by the publicity shot below in which the director has exchanged places with the film's central cadaver. Two aspects of Rope that are perhaps most worthy of mention are its Technicolor New York skyline set and Stewart's unsettling performance as Caddell. The former, known as the "cyclorama", was the largest such backdrop ever created on a studio sound stage, an exact miniature of nearly 35 miles of buildings powered by 8,000 bulbs and 200 neon signs sucking up 126,000 watts of juice. The clouds were made of spun glass and the whole enterprise serves to simultaneously represent the passing of time from 7.30pm to 9.15pm as evening descends, signify the elite social setting and make the production feel less stagebound (something the likes of 1954's Dial M For Murder would suffer from), confined as it is to a single location. I think the device also serves to puncture the illusion of reality somewhat because, as convincing a background as it is, we are never entirely distanced from the fact that it's just a prop, a special effect, something that would not occur to us as viewers if Rope had been shot on location. Thus, like the obviously staged Baltimore harbour in Marnie (1964), we know we are complicit in a fantasy, someone else's sick dream of murder and intrigue. James Stewart, meanwhile, was already well on the path to having his wholesome screen persona dissected and corrupted by his director, a process that would reach its creepy conclusion in Vertigo (1958). He arrives at the party and immediately dominates, assuming control of the situation from his hosts and former pupils, offering prickly barbs to everyone he's introduced to before launching into his edgy, whimsical thoughts on homicide as a means of entertaining the company. However, he soon finds himself playing detective and ends up horrified and ashamed when he learns the truth of Brandon and Phillip's actions. A returning war hero by this point, Stewart had been tormented by his experiences in the US air force and briefly considered retiring from acting altogether. His roles thereafter reflected the burden of a generation, a million miles away from the screwball comedies he so excelled in during the 1930's. As Amy Lawrence observed in an essay for Hitchcock's America (1999), “nearly all of Stewart's post-war roles are haunted by an undercurrent of confusion, guilt and shame." George Bailey from It's A Wonderful Life (1946) was perhaps the first of Stewart's darker characterisations but Hitch and Rope gleefully continued the all-American boy's moral decline. Interestingly, Stewart was hugely unhappy on the set of Rope because he felt his director was only really concerned with camera positions and other technical aspects of the production and cared little for his actors' performances. 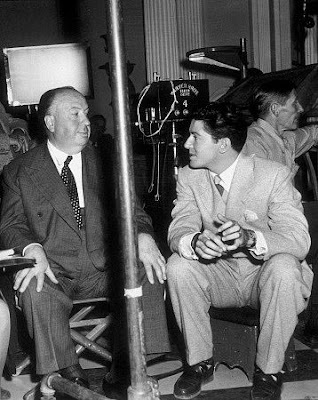 So much so, in fact, that he vowed never to work with Hitchcock again. Until he saw the script for Rear Window, that is, when the allure of Grace Kelly proved too big an enticement.